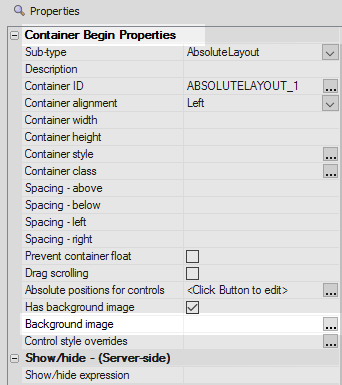 Create a PDF file from the contents of an Absolute Layout container. This action is used with the UX component. For an explanation of how to use this action watch this video or read the guide below. 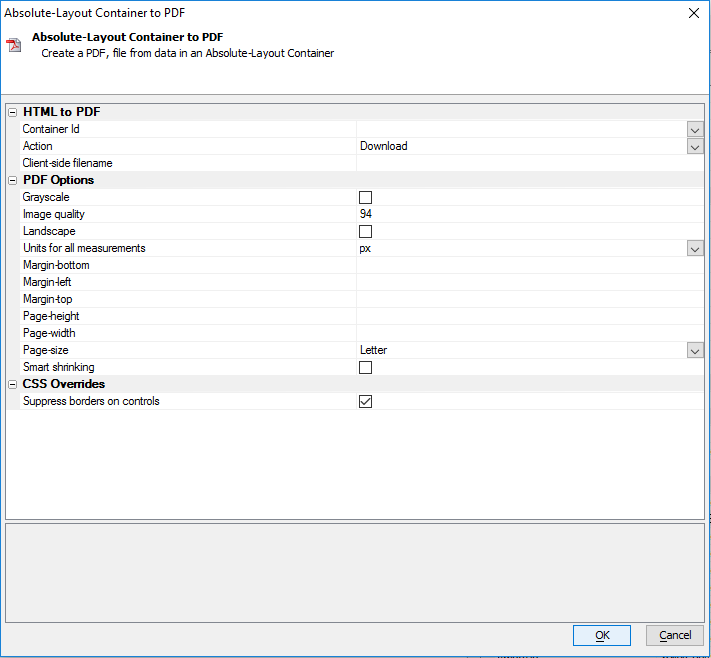 Specify whether the Create PDF action downloads a PDF file or whether it use an Xbasic function that takes a PDF filename as a parameter.. Specify the name of the Xbasic function. The function takes 'e' as a parameter. The 'e' object contains e.filename, the filename of the PDF file that was created. When a PDF is created it appears in grayscale instead of in color. Adjust the image quality of the information and images that appear on the created PDF. The PDF will be created with a Landscape orientation. Select the units to use for setting the margins and other size properties for the PDF when it is created. Options include: px, in, cm, mm, pt, and tw. Sets the margin at the bottom of the pdf that is created once the action fires. The units used to set all margins are defined in the 'Units for all measurements' property. Sets the margin on the left of the pdf that is created once the action fires. The units used to set all margins are defined in the 'Units for all measurements' property. Sets the margin on the top of the pdf that is created once the action fires. The units used to set all margins are defined in the 'Units for all measurements' property. Set the height of the PDF. The units used to set the page height are defined in the 'Units for all measurements' property. Set the width of the PDF. The units used to set the page width are defined in the 'Units for all measurements' property. Specify whether the Page-size of the PDF should be 'Letter' or 'A5'. Adjusts the size of the information displayed of the created PDF. Add a second textbox to the control. 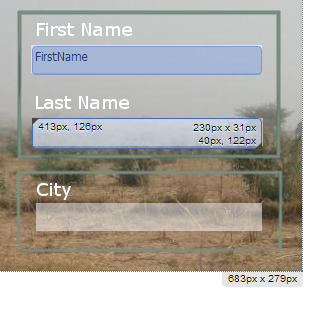 Set this textbox's name and label to read 'Lastname'. 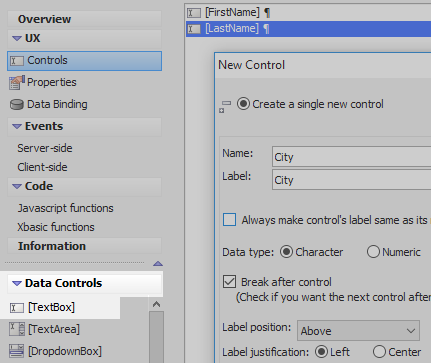 Highlight all of the textbox controls in the control tree. 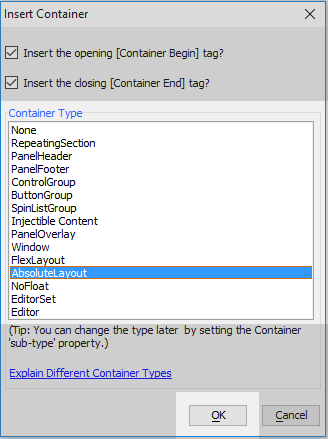 Open the Containers menu and click on the [Container] option. 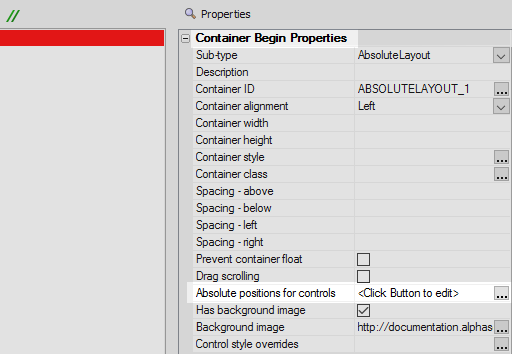 Highlight the Absolute Layout container in the control tree. 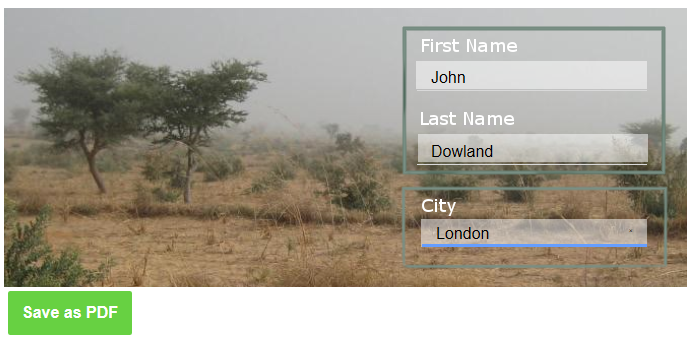 In the properties list check the 'Has background image' property in the Container Begin Properties section. 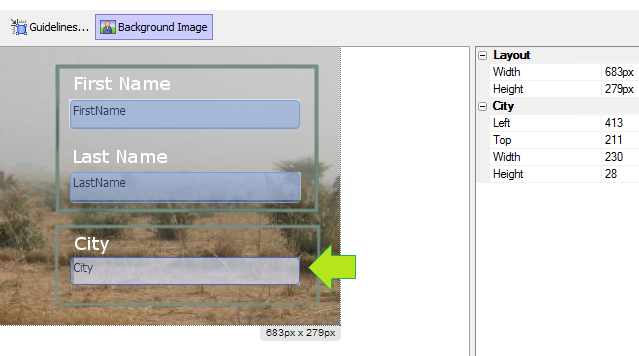 Click the [...] button next to the 'Background image' property. 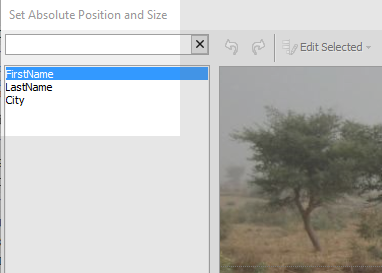 Click on the [...] button next to the 'Absolute positions for controls' property. 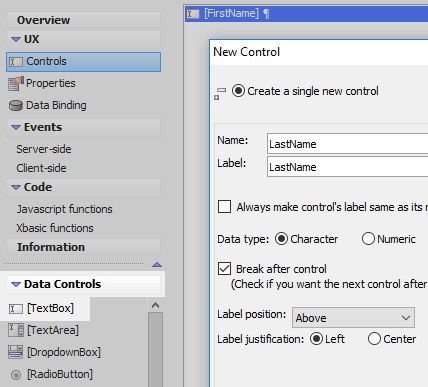 In the 'Set Absolute Position and Size' dialog list of control names, select the 'Firstname' control. 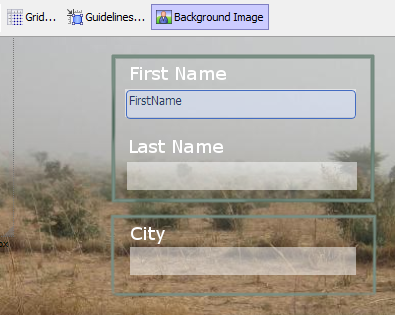 On the drawing surface with the displayed background image, click in the white box with First Name written above it. 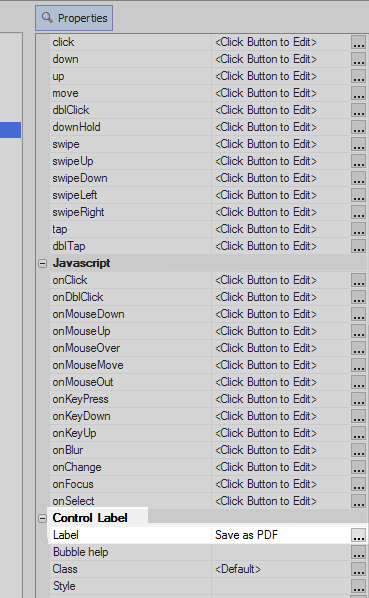 Without lifting you finger from the mouse drag out the control until it is visible. Highlight the 'Lastname' control and place in the white box underneath the 'Last Name' text. You can set the container width and height on the drawing surface by dragging the dotted border around. Highlight the [AbsoluteLayout End: ABSOLUTELAYOUT_1] tag. 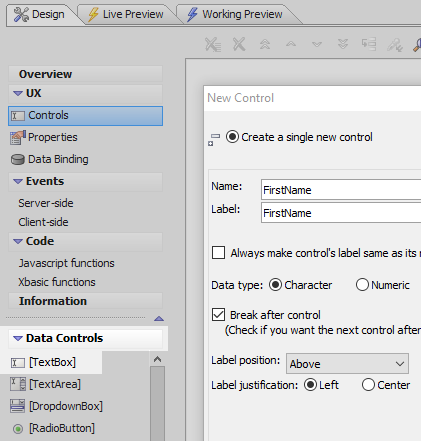 Open the 'Other Controls' menu and click on the [Button] option to add a button to the component. Highlight the Button. In the properties list, in the 'Button Properties' section, set the 'Button text' property read 'Save as PDF'. Type 'pdf' into the Filter list. 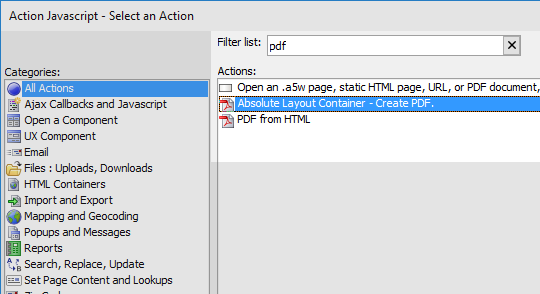 From the resulting actions select 'Absolute Layout Container - Create PDF' and click OK. In the properties list that appears set the 'Container Id' property in the HTML to PDF section to be 'ABSOLUTELAYOUT_1'. Leave the 'Action' property set to 'Download'. Set the 'Client-side filename' to be 'mytempfile'. This will be the name of the pdf file that will be created. Click OK and Save. Run the component in Live Preview. Type some information into the textboxes. 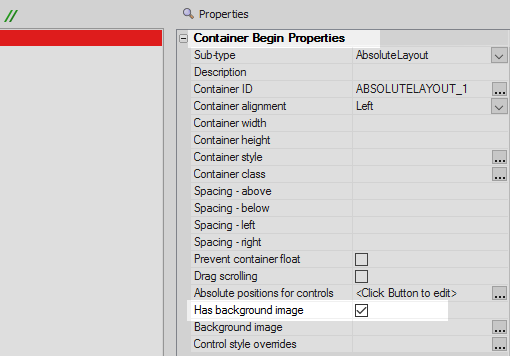 If the text boxes do not accept text try returning to the AbsoluteLayout container and making the control's' height larger in the 'Absolute positions for controls' property. Click the 'Save as PDF' button. 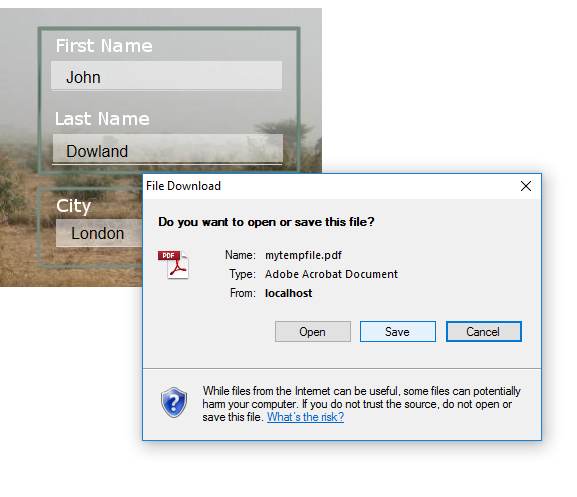 Click the 'Save' button when prompted and then 'Open' the file. The form should open in PDF format with the edits included.